USSR: The Cotton Workers' strike at the Teikovo Calico works outside Moscow, which began on 8 Apr 32 in response to decreased food rations, is called off for having achieved nothing. CBI - China: Day 106 of 142 of the 1st Battle of Hebei. Spain: Day 274 of 985 of the Spanish Civil War. Spain: Day 639 of 985 of the Spanish Civil War. CBI - China: Day 284 of 2,987 of the 2nd Sino-Japanese War. Day 69 of 124 of the Battle of Henan. Day 24 of 39 of the Battle of Xuzhou. Czechoslovakia: Following the annexation of the Sudetenland into Nazi Germany, the Wehrmacht moves in to occupy the remainder of the weakened country. Its territory is divided into the Protectorate of Bohemia and Moravia and a newly-declared Slovak Republic. USSR: The Soviets make their final attempt to form some kind of an alliance between the United Kingdom, France and the Soviet Union to contain German aggression. CBI - China: Day 649 of 2,987 of the 2nd Sino-Japanese War. Day 31 of 54 of the Battle of Nanchang. Atlantic: Iceland declares independence from occupied Denmark and asks the United States for recognition. Much of Denmark's leadership had fled to the Danish colony of Iceland as the German invasion began on 10 Mar 40. Atlantic: British troops land at the Faeroe Islands, a constituent country of Denmark. ETO - Norway: Day 8 of 63 of the Battle of Norway. The defending British troops discover they are ill-equipped. The ones at Namsos didn't bring their anti-aircraft weapons due to lack of space on the boats. CBI - China: Day 1,015 of 2,987 of the 2nd Sino-Japanese War. Day 154 of 381 of the Battle of South Guangxi. USA: The first US Lend-Lease food shipment arrives in Britain. Atlantic: German armed merchant cruiser THOR stops the Swedish ship SIR ERNEST CASSELL 500 miles southwest of Cape Verde Islands. The ship is scuttled with demolition charges. ETO - UK: Day 223 of 258 of the Blitz. The Luftwaffe launches a very heavy raid against London. Eastern Front: The German embassy in Moscow continues to report unexpectedly friendliness from the Soviets toward Germany. MTO - Yugoslavia: Day 11 of 12 of the Axis invasion of Yugoslavia. Yugoslavian leaders negotiate armistice terms with the Germans in Belgrade, but they do not have sufficient authority to sign a surrender document. In Zagreb, the Croatian leader Ante Pavelic formally comes into power as the head of the Independent State of Croatia. MTO - Greece: Day 11 of 25 of the Battle of Greece. German troops attack the Platamon Pass between Mt Olympus and the Aegean Sea forcing New Zealand troops to withdraw. MTO - Libya: Day 7 of 256 of the Siege of Tobruk. The Italian troops attack Tobruk but are driven back by heavy artillery fire. An entire Italian Battalion is captured. MTO - Tunisia: The British Navy ambushes an Axis convoy on the Tunisian coast sinking and damaging several ships and killing 1,800 Axis personnel. The Italian LUCA TARIGO hits the HMS MOHAWK which has to be scuttled. East Africa: Day 311 of 537 of Italy's East African campaign in the lands south of Egypt. CBI - China: Day 1,380 of 2,987 of the 2nd Sino-Japanese War. CBI - Thailand: Day 198 of 221 of the Franco-Thai War (Vichy France vs Thailand). Atlantic: Day 93 of 169 of Germany's Second "Happy Time," during which U-boats sink 609 Allied ships with little risk. U-123 sinks the US freighter ALCOA GUIDE east of North Carolina. USS R-1 detects German submarine U-582 on the surface and fires three torpedoes; her commanding officer claims one of them hit, damaging the target. Russian Front - North: Day 221 of 872 of the Siege of Leningrad. Russian Front - North: Day 68 of 102 of the Battle of the Demyansk Pocket, another failed attempt to break the siege at Leningrad. Russian Front - North: Day 84 of 103 of the Battle of the Kholm Pocket. Another attempt to break the siege at Leningrad. Russian Front - Center: Day 99 of 103 of the Battle of Vyazma, Russia. Russian Front - Center: Day 99 of 103 of the Battle of Sychevsk, Russia. Russian Front - Center: Day 45 of 49 of the Battle of Rzhev, Russia, a diversion to pull more German troops away from Moscow. Russian Front - South: Day 169 of 248 of the Siege of Sevastopol, Crimean Peninsula. CBI - Burma: Day 124 of 164 of Japan's Invasion of Burma. Day 6 of 9 of the Battle of Yenangyaung. Japanese troops decisively defeat the 1st Burma Division near Yenangyaung. US 10th Air Force B-17s bomb Rangoon. CBI - China: Day 1,745 of 2,987 of the 2nd Sino-Japanese War. PTO: The Japanese Imperial Navy orders Admiral Yamamoto to draw up plans for Operation MI, the capture of Midway. PTO - Malaya: Day 57 of 357 of the Battle of Timor Island. PTO - Philippines: Day 130 of 152 of the 1st Battle of the Philippines. Japanese troops land on Panay and Negros Islands. ETO - UK: The Luftwaffe makes their first night fighter attack on London which does not go well. Four of the German pilots get lost and, thinking they are over France, they land at an RAF fighter base in Kent. Previous attacks had all been made by bombers. ETO - France: US 8th Air Force B-24s and B-17s bomb U-boat bases. Russian Front - North: Day 586 of 872 of the Siege of Leningrad. Russian Front - North: Day 347 of 658 of the Siege of the Kholm Pocket. MTO - Tunisia: Day 151 of 178 of the Battle of Tunisia. RAF and US Air Forces provide Allied air support. The British 8th Army abandons their quick jabs on Enfidaville and prepare for a full-scale assault. MTO - Italy: US 9th Air Force attacks targets in Sicily. MTO: The British destroyer HMS PAKENHAM and two Italian destroyers are sunk during naval engagements in the Sicilian Channel. CBI - Burma: Day 68 of 79 of the Allied Operation LONGCLOTH. US 10th Air Force provides air support. CBI - China: Day 2,110 of 2,987 of the 2nd Sino-Japanese War. US 14th Air Force hits a group of buildings east of Tenchung. PTO - Alaska: Day 314 of 435 of the Battle of Kiska, Aleutian Islands. US 11th Air Force attacks Kiska Island. PTO - Solomon Islands: Day 16 of 16 of Japan's Operation I-GO. Admiral Yamamoto halts the operation, believing it to have been a success. However, Allied preparations for further offensives in the South Pacific area have not been significantly delayed. Germany: 1,500 Jews from Drancy Concentration Camp outside of Paris arrive at Auschwitz. 165 men and 223 women are registered into the camp, while the remaining 1,112 are immediately gassed. Russian Front - North: Day 75 of 191 of the Battle of the Narva Isthmus, Estonia. Both German and Soviet troops remain in their defensive positions. Russian Front - South: Day 44 of 45 of the Battle of Chernovtsy, Ukraine. Russian Front - South: Day 42 of 44 of the Battle of Snigirevka, Ukraine. Russian Front - South: Day 9 of 35 of the Battle of the Crimea. The Soviets clear Yalta. Russian Front - South: Day 9 of 60 of the Battle of Romania, 1st Jassy Offensive. MTO: US 15th Air Force B-17s and B-24s attack targets in Yugoslavia, and Romania. MTO - Italy: Day 91 of 123 of the Battle of Monte Cassino. RAF and US Air Forces provide air support. The German Gustav Line is getting weaker. MTO - Italy: Day 86 of 136 of the Battle of Anzio. RAF and US Air Forces provide air support. CBI - Burma: Day 43 of 166 of the UK's Operation THURSDAY. CBI - Burma: Day 38 of 147 of the Battle of Myitkyina. US 10th Air Force provides air support. CBI - Burma: Day 16 of 302 of the Chinese Salween Offensive. US 14th Air Force provides air support. CBI - China: Day 2,476 of 2,987 of the 2nd Sino-Japanese War. CBI - India: Day 40 of 118 of the Battle of Imphal-Kohima. The Japanese blow up a 300 foot suspension bridge on the Silchar track near Imphal. The Indian 5th Brigade arrives at Jotsoma allowing the Indian 161st Brigade to prepare for an assault on Kohima. PTO - Caroline Islands: US 7th and 13th Air Forces bombs at Truk and Satawan Atolls. PTO - New Guinea: Day 48 of 80 of the Battle of the Admiralty Islands. 5th Air Force provides air support. PTO - New Guinea: Day 211 of 219 of the Battle of Shaggy Ridge. 5th Air Force provides air support. PTO - New Guinea: Day 124 of 597 of the Battle of New Britain. US 13th Air Force provides air support. PTO - Solomon Islands: Day 168 of 295 of the Battle of the Bougainville Islands. US 13th Air Force provides air support. ETO - Netherlands: Day 3 of 5 of the Battle of Groningen. The Canadian troops capture Harlingen and Groningen. ETO - France: Day 261 of 284 of the Battle of Brittany. ETO - France: Day 214 of 236 of the Siege of Dunkirk. ETO - Germany: Day 42 of 46 of the Battle of the Ruhr Pocket. US 9th Air Force provides air support. US 1st Army takes Solingen and Wuppertal. ETO - Germany: US troops enter Nuremberg. ETO: The Allied Chiefs of Staff formally decree the ending of their area (carpet) bombing campaign against Germany. ETO - Germany: RAF Lancaster bombers cripple the German heavy cruiser LUTZOW at Swinemunde. One of the bombers fails to return, becoming this Squadron's final loss of the war. ETO - Germany: US 8th Air Force B-17s and B-24s bomb rail targets. Russian Front: Off the Hela peninsula in the Baltic, the Soviet sub L-3 sinks the German passenger liner GOYA, killing 6,000 people being evacuated from East Prussia. Russian Front - Finland: Day 214 of 223 of the Lapland War. Finland and Russia have joined forces to kick the Germans out of Finland's most northern province. Russian Front - Center: Day 184 of 206 of the Battle of the Courland Pocket in Latvia. Russian Front - Center: Day 4 of 13 of the Battle of Zemland, East Prussia. Russian Front - Center: Day 1 of 23 of the Battle of Settin-Rostock, both sides of the border between Germany and Poland. Day 1 of 4 of the Battle for the Oder-Neisse Rivers. Russian Front - Center: Day 1 of 17 of the Battle of Berlin. The main push to Berlin begins. Russian Front - Center: Day 63 of 83 of the German Siege of Breslau (today Wroclaw, Poland). The Soviets continue with their siege. MTO - Italy: Day 11 of 27 of Operation GRAPESHOT, a successful offensive in northern Italy. MTO - Italy: Day 8 of 13 of the Battle of Bologna. MTO - Italy: Day 5 of 8 of the Battle of the Argenta Gap. The British 8th Army keeps driving into the gap near Portomaggiore. CBI - Burma: Day 72 of 99 of the Battle of Pakokku and Irrawaddy River operations in central Burma. The US 10th Air Force provides air support. The Indian 5th Division captures Shwemyo while the Anglo-Indian 4th Corps reaches within 240 miles of Rangoon. CBI - China: Day 2,841 of 2,987 of the 2nd Sino-Japanese War. Day 16 of 91 of the Battle of Zhijiang. US 14th Air Force provides air support. Day 8 of 60 of the Battle of West Hunan (near Zhijiang). PTO: The US submarine USS KETE is presumed lost, having been scheduled to arrive at Midway by 31 Mar 45. She had sent in a weather report on 20 Mar 45 from a position south of Colnett Strait and was neither seen nor heard from again. PTO - Alaska: US 11th Air Force B-24s bomb the Kataoka naval base on Shimushu Island. PTO - Formosa: US 5th Air Force B-25s hit Taien Airfield, while B-24s and P-51s bomb the Giran and Matsuyama Airfields. PTO - Japan: Day 16 of 83 of the Battle of Okinawa. US Army troops land on Ie Shima and three airfields are taken. Meanwhile, special Japanese attack aircraft sink a US destroyer and damage a number of other warships. PTO - New Guinea: Day 476 of 597 of the Battle of New Britain. US 10th Air Force provides air support. PTO - New Guinea: Day 360 of 481 of the Battle of Western New Guinea. US 10th Air Force provides air support. PTO - Philippines: Day 179 of 299 of the 2nd Battle of the Philippines, aka the Liberation of the Philippines or the Philippines Campaign. PTO - Philippines: Day 123 of 244 of the Battle of Luzon. 5th Air Force provides air support. PTO - Philippines: Day 38 of 159 of the Battle of Mindanao Island. 5th Air Force provides air support. PTO - Philippines: Day 30 of 135 of the Battle of the Visayas region. US 5th and 7th Air Forces provide air support. Poland: Nazi war criminal Rudolf Höss is executed by hanging next to the crematorium at Auschwitz I concentration camp. He is regarded as history's single largest mass murderer. 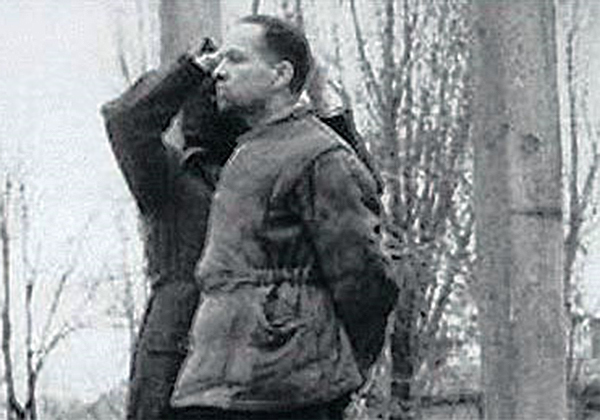 Höss was hanged next to the crematorium of the Auschwitz I concentration camp where he had been Commandant. He became Commandant of the Auschwitz concentration camp in 1940, having developed mass extermination techniques previously in Dachau and Sachsenhausen. I want to emphasize that I personally never hated the Jews. I considered them to be the enemy of our nation. However, that was precisely the reason to treat them the same way as the other prisoners. Besides, the feeling of hatred is not in me. Since I was Commandant of the extermination camp Auschwitz I was totally responsible for everything that happened there, whether I knew about it or not. Most of the terrible and horrible things that took place there I learned only during this investigation and during the trial itself. I cannot describe how I was deceived, how my directives were twisted, and all the things they had carried out supposedly under my orders. I certainly hope that the guilty will not escape justice. It is tragic that, although I was by nature gentle, good-natured, and very helpful, I became the greatest destroyer of human beings who carried out every order to exterminate people no matter what. USA: The first use of the term Cold War is used to describe the post-war tension between the Western Allies and the Soviet Union when American presidential adviser Bernard Baruch delivers a speech saying "Let us not be deceived. We are today in the midst of a cold war." Pacific: Starting on this date and lasting through the following month, the US will test three nuclear weapons at Eniwetak in the Marshall Islands.